It all started following a suggestion from one of our previous members, a certain Mr John Smith (He of Brum) that his mate John Bowden (The Creator) was short of operators for a couple of exhibitions and would we like to attend and operate his layout. Be aware that John (The Creator) lives darn sarf and his buddies didn’t want to travel all the way ap norff!! Well, a question like that only needs asking once, and the answer was emphatically in the positive! So off we trotted to a couple of shows, I think it was one was Southwold and one was not at Southwold but was somewhere else! Whilst sitting in a house of refreshment during the evening of one of the shows John (The Creator) calmly announced that he was going to build a new layout (to be called Kimmeridge) and his present layout (Langton Herring) was going to be retired (scrapped!). That set the old cogs rotating within the noggins of both The Big Decider and Mr X. A quick discussion away from the bar and unaffected by the brown liquid, the fearless two decided that they might make a suggestion to that August Body known as “The Committee” that the club may like to consider the purchase said layout for our own use. The Committee deliberated and deliberated and deliberated and finally decided that they couldn’t decide but instead they would put the suggestion to the membership at large (and some of the members are large) regarding the purchase from Mr Bowden of said layout. A “Special General Meeting” was called for Friday 26th of February 1993 to put the suggestion to the membership at large. Our Chairman Mr Alan Walters (The Big Decider) opened the meeting by explaining the situation to the assembled throng and he reported that The Committee refused to come to a decision due to the amount involved (£750-£800), but would let the general membership decide, thus the need for the Open Meeting. Various points of view were aired and as I recall there were some strong arguments both ways, it was an entertaining hour or so!! So arrangements were made to attend and exhibit with John and the layout for its final showing at the Leeds Show on 30th/31st October 1993 and at the end of the show the layout would be transported to LMS HQ in Chesterfield and become the property of the club, deal done!! So, we were then the proud owners of an “0” Gauge layout but in truth between us we actually owned very few “0” gauge locos or items of rolling stock so it was onwards and upwards with the building of some trains! The layout is 32” feet long which consist of 6” feet for a fiddle yard and 26” feet of visible section. 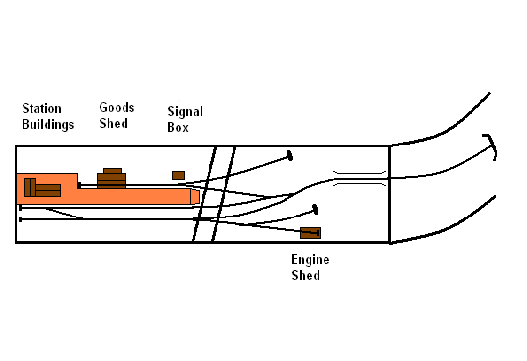 As the attached drawing shows it’s a single track branch line leading to a single platform terminus. The line emerges from the fiddle yard under the ubiquitous bridge/tunnel mouth and winds its way past a derelict building with an amorous couple doing their thing inside, it then passes over a level crossing to make its way towards a small steam which is traversed by a girder bridge. Open fields are then passed on the way to the station and its environs. As we approach the station we firstly see on our left hand side the single road engine shed, we then pass under a road bridge (which looks of decidedly dodgy construction and viability!) and find the signal box at the end of the platform to our right quickly followed by the goods shed again on the right and finally into the single face platform and the buffer stops. So, we were now the proud owners of a nice exhibition layout and through friends we knew we were invited to a few shows and it has to be said we did have a great deal of fun at them, plus the obvious intake of the various amber liquids at the evening bashes at these shows. We attended the following shows where we didn’t actually win any pots but we had a grand old time. No further shows were attended as an extension was now planned! That was 14 years ago!!!!!!! At that point here were around 4 or 5 of us at the club actively working in “O” gauge, The Big Decider, Mr X, Pete Garrett, Martin Hibbard and Graham Cree plus distance members John Smith (He of Brum) and Pete Smith (Whissendine Man) [also the proprietor of Kirtley Models of which more later] and some of the other membership, whilst not actually making locos, wagons or coaches were intrigued by the apparent size of things and decided to get involved in a little renovation. The Creator, being a ‘suvener’, had obviously set his layout ‘darn sarf’ so the first thing to do was change the colour scheme of the buildings to represent a more ‘norvern’ location. Whilst the preference of most of us is BR (LMR) the only tin of paint to present itself on the fateful night of the repainting was blue so we ended up with a layout purporting to be located in the eastern region. That, however, was not going to stop us running our favourite trains. It also had the dubious advantage that the majority of stock at this time was in fact of eastern origin. The lack of working signals on the layout was rectified by The Big Decider who, amongst his other peculiar leanings, has a thing about building signals, went ahead and built some. The station building, goods shed, signal box and loco shed were all constructed to represent a sort of Cotswold type stone construction which did not fit well with our new location (and the station building had no windows just great big gaping holes where they should have been fitted by the Creator but never were) so a rebuilding programme was agreed upon. Whissendine Man volunteered (was coerced?) into making replacements for the station, goods shed and signal box and it has to be said that Pete came through with a vengeance, the buildings he produced were well up to his usual superb standards, a pity I didn’t con him into doing the shed replacement as well!! “I’ll sort out the loco shed” says Bernie so the surface texture from the mock stonework was sanded off and a start made on cladding it with Slaters brick Plasticard but alas Bernie has secured a new job which has taken him away to pastures new, a strange place called Manchester, and so work has come to a halt, another polite and grovelling approach to Whissendine Man may well be on the cards? We attended the shows as listed above, with some of our own and some borrowed stock, and then The Big Decider decided that we ought to extend the layout into a through station and on to a second fiddle yard. The extension was wired up by Martyn Brailsford (The Vital Spark). “It’s Martin with a ‘Y’.” he keeps telling me but he seems to get really annoyed when I call him Yartin, where am I going wrong? Graham (Mr Cree) volunteered to build a pub. it is to be located on the first extension board just passed a level crossing. Its construction was later taken in hand by Pete Garrett (PG) and progress has been made but a completion date and hence formal opening ceremony has yet to be agreed. When the pub finally arrives it will be named, at the suggestion of our esteemed Secretary PC, as The Ranting Leghorn (which he tells me is an anagram of the layouts original name of Langton Herring) and apparently it will sell Fowl Ales! PG also offered to make a factory and associated buildings and I guess at the last sighting there are around 90% complete. Cast plaster pieces have been obtained for the bridge and retaining wall that are going to disguise the departure point to the new fiddle yard but no progress other than unwrapping the castings has been made with this so far. A general refurbishment of the scenery has been undertaken by our revered Treasurer Steve Spencer (Stone Wall Steve) plus a few other occasional helpers and it looked good, just needs the final touches. Now for those of you reading this that are not blessed with actually being members of our little band and thus don’t know the club arrangements I will elucidate. The club is located in a pair of cottages with an attached sizeable barn that we completely reconstructed a good few years ago. The upstairs of both cottages contain the clubs permanent “OO” layout, a modelling room and an “OO9” room and therefore there is no spare space. The downstairs contains our museum room (full), entrance room (full), The Green Room which houses an on-going N gauge layout and the all-important kitchen therefore the only place for the “O” gauge layout is in the barn. But, and there is always a But isn’t there, we also possessed in the dim and distant past an “OO” gauge exhibition layout named Scagill which has long since been laid to rest but the baseboards were salvaged and a New Exhibition Layout (known as NEL) was started, I think at this point I should confirm that Richard Attenborough’s dream of a Jurassic Park lives on, dinosaurs still live, we are creating one right now in the barn called NEL!! This of itself is an issue as the Barn is only big enough for either NEL or Springwell to be erected and worked upon and NEL won out in that battle so Springwell is stored. So we have a barn full of a new “OO” layout (dinosaur) NEL under construction which seems to have completely stalled through lack of interest and an “O” gauge layout that is stored and inaccessible and also now in need of a good deal of further work before it could ever possibly venture out onto the exhibition circuit again. So to conclude, we have NEL that is erected but no one seems interested in and we have Springwell that is in railway parlance stored OOU (Out Of Use) and similarly hardly anyone seems interested in, it all seems such a shame after all the time and money invested in both so far?